A collaboration with E.G. Crichton. This installation/intervention occurred at the international feminist conference “Transformations,” held at Lancaster University in England. We used the “Before and After” theme to depict change. We created 122 magnetic theoretical buzz words that people could arrange into complex and often humorous identity labels on bathroom stalls. We secretly stamped provocative questions on the underside of the napkins at each table. 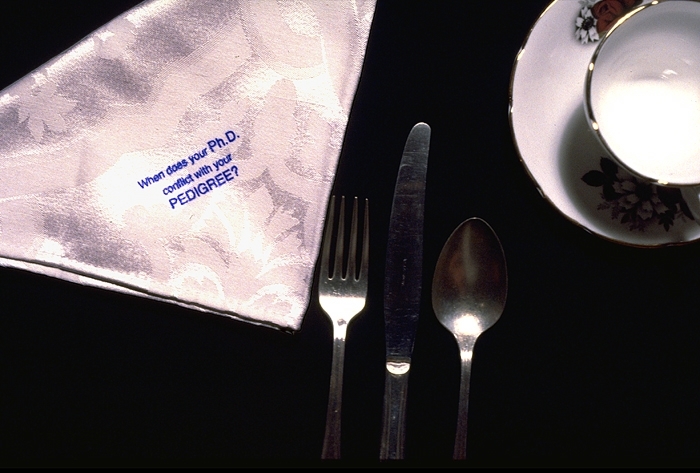 These questions were revealed during a formal banquet as the diners unfolded their napkins.